The 2018 Hawks Aloft Raffle Quilt. It was designed collaboratively between Barb Deshler and Yours Truly. 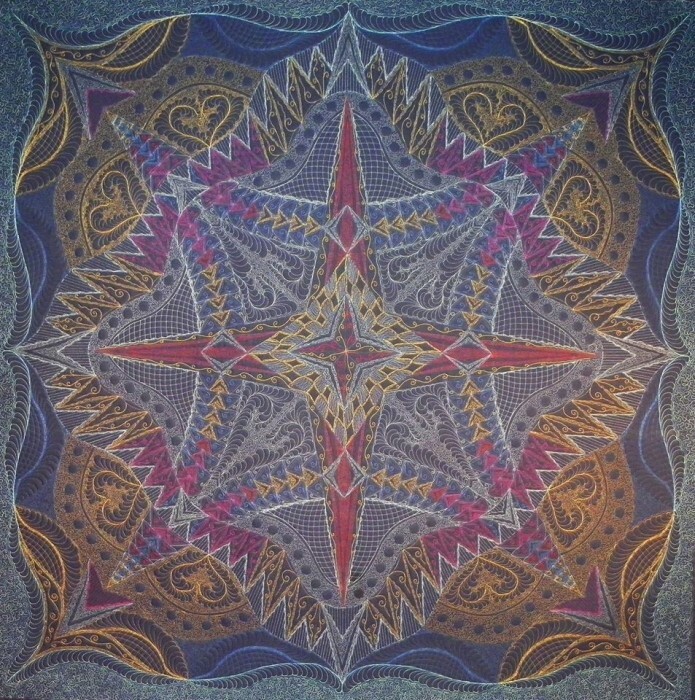 The quilt top was stitched in one weekend at my cabin in the Jemez Mountains, by 12 stitchers. Donna Barnitz and Barb Deshler provided pre-retreat sewing and Tisha Cavanaugh quilted it on her longarm quilting machine. Tickets are $1 each or 6/$5. Click Here to buy tickets. The winning ticket will be drawn at our annual holiday party on December 1, 2018. All proceeds go to purchase food for the educational ambassadors of Hawks Aloft, the organization I, and others founded in 1994. Click Here to learn more about Hawks Aloft. with Ricky Tims and Alex Anderson! Visit the Archives to find this Episode! What fun we had filming! Do you see the special guest in the background? Stay tuned to learn all about the show, and a big reveal! 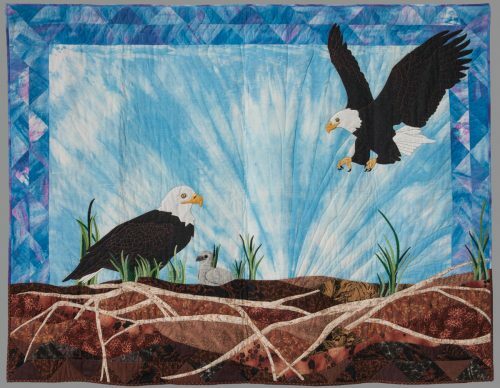 Check out this video by the American Quilter’s Society created in January 2015. 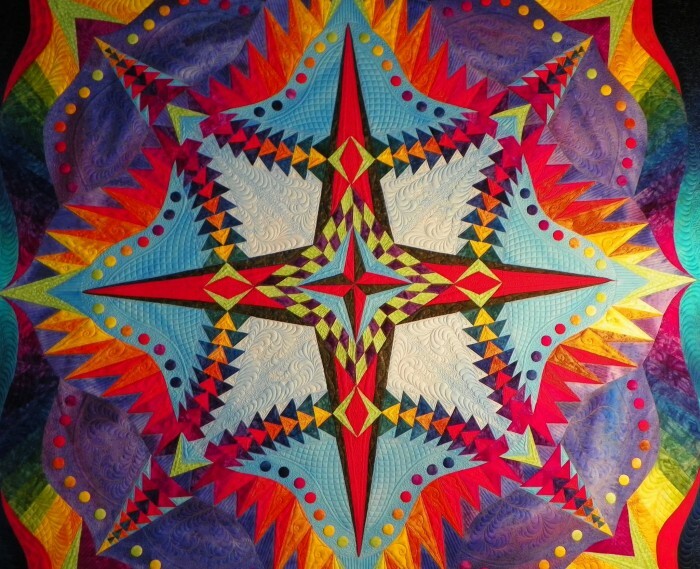 The video features 30 different quilts, created over a period of 30 years. What fun it was to work on my this collaboration with Kris Vierra. We call our new quilt, “Celebration”, which seems to be an appropriate word for our quilt partnership. I design and stitch the quilt top and Kris works her magic in the quilting design and stitching. We hope you like it too. Here’s the back of the quilt which really shows off Kris’ mastery in stitching. 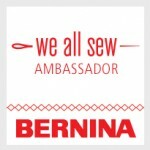 I am proud to be a Bernina Ambassador. I first fell in love with this brand some 25 years ago when I received an 1230 as a gift. Little did I know it would change my life in so many ways! For many years, I was fortunate to be the recipient of a loaner machine from the company. I stitched on several different machines, but when I received my loaner 730, I fell head-over-heels in love. Now, I own my beloved 730, purchased from my local dealer, Ann Silva’s Bernina Sewing Center in Albuquerque, NM. This is also the place where you will find me teaching locally! It is so important to shop local! Support your local shops! 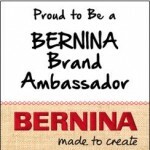 If you click on the Bernina badges, you will find that they are live links. We did it again! A huge thanks go to Barb Deshler for helping with the design of this year’s quilt, and to Donna Barnitz for helping to pre-sew the center of the quilt. 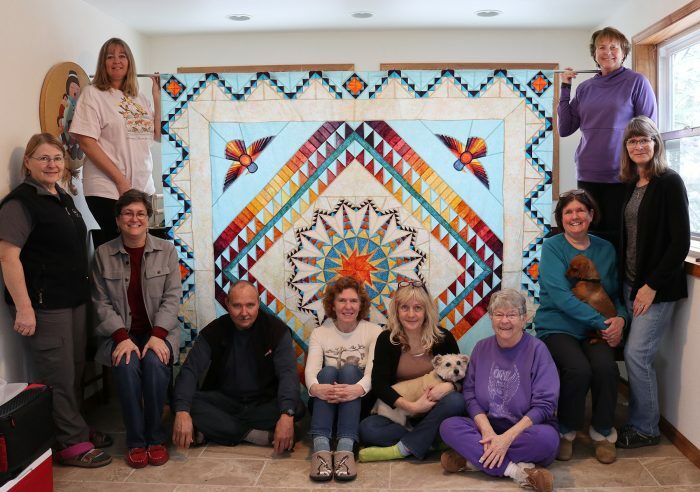 The rest of the quilt top was completed by our team of 12 people in 12 hours on Saturday, January 20, 2018. The winning ticket will be drawn on December 1, 2018. You can purchase tickets here. All funds raised go to support our team of non-releasable avian ambassadors that are the focal center our our education programs. 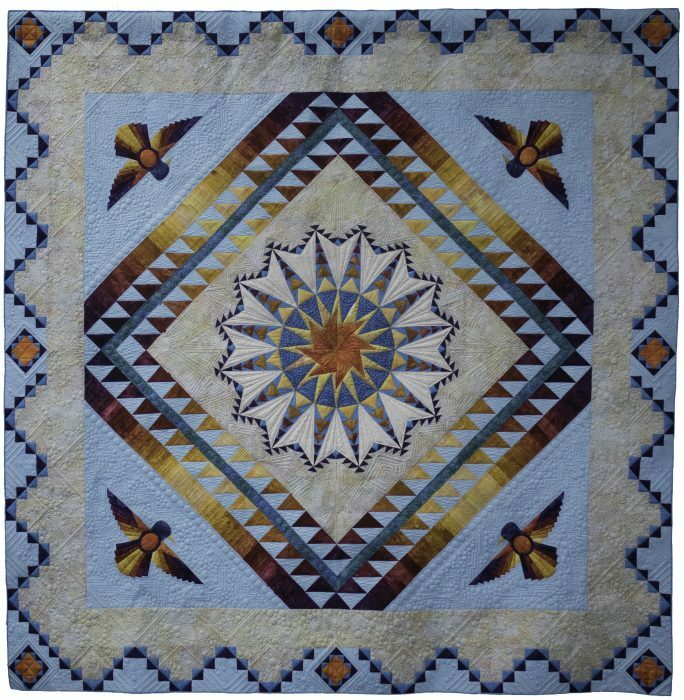 Thanks to Tisha Cavanaugh who stitched the quilt layers together with her longarm quilting machine. 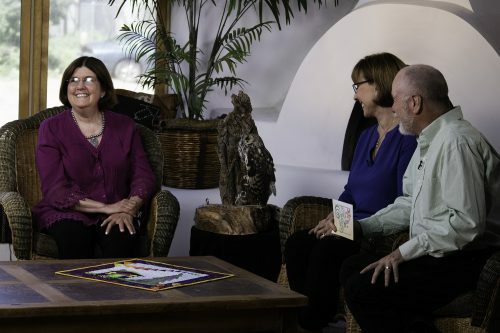 Learn more about Hawks Aloft, the organization that we founded in 1994 and the work that we continue to do in New Mexico and surrounding states.